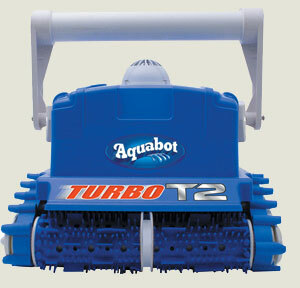 I bought an Aquabot turbo T2 two years ago and it was one of the most poorly built pool cleaners I have ever seen. It didn't make it through the first season without a complete failure. When I got it back from Aquabot, it worked for another couple of runs but then a whole slew of parts wore out simultaniously. Both belts and virtually every bearing (calling them bearings is being a bit generous since they are just plastic on plastic bushings) on the robot was so worn that you could see that they were ovals rather than round holes. This wear took place in a brand new pool in less than 20 runs. I didn't even bother to get it repaired after this because it seemed inevitable that the same thing would happen again. Before the turbo T2, I had an Aqua Queen. I used that for many years and never had to repair or replace anything. I am very surprised that you have had such good luck with your Aquabot because mine seemed to have inherent design flaws rather than poor workmanship. "Poor design, poor workmanship, and poor customer care. I would like to be able to say it moves about in the pool with ease, but it barely moves at all. It can not climb walls. The filter basket was broken when it was purchased. It does not clean the pool surfaces it walks across very well. I contacted Aquabots 1-800 service number the first week I had it and they were not interested in replacing or fixing this unit. But they were willing to sell me some recommended parts. Please try another manufacturer and avoid Aquabot Products." We have a simple, rectangle 40 X 20 pool. The ownership of the T2 was MISERABLE!! It would not clean the pool as advertised, in 1 hour or even 7 hours. It would skip large areas completely and get hung up on our very simple stairs and stay hung all day if you let it. I spent several hours on the phone with tech support and even sent it back to them for repair but it still didn't work. We tried many, many attempts to correct its behavior with no luck. Doheny's was great and refunded my money. I am now gun shy and afraid to shell out $1,000 for another attempt at a robotic cleaner. All the reviews I have read about these pool cleaners seem to focus only on their ability to clean, but never on their ability to keep cleaning after a season of use. I have a Turbo T2 and I would agree with anyone who says that it is a good cleaner, but after only one season of use it is completely worn out. When I say worn out I don't mean that a part broke, I mean that every bearing in the machine is so worn out that the belts are slipping and there is no way to fix it. The bearing system in the Turbo T2 is simple plastic on plastic unlubricated shafts through holes. No ball bearings, no replacable bushings, no way to fix it. I got mine repaired under warranty but it took weeks and the robot was worn out again in a few runs. Actually when I say that it was repaired under warranty I am being a bit generous. Since there actually is no way to repair the bearings for the tracks and brushes they simply replaced some belts that were slightly stretched and that got the thing working, but it wasn't actually repaired. After a few runs it stopped working again and this time not only were the belts slipping again (because the b plain bearing were so worn that the belts weren't tight, and could not be tightened) but the main pump/drive motor also stopped working. As a design engineer myself I have to say that the quality of this pool cleaner is extremely poor. I could understand a $50 pool leaf bagger being built this cheaply but for a cleaner that costs over a thousand dollars it is inexcusable. I used to have an Aqua Queen at my previous pool/house, and that thing was built to last a dozen seasons. Of course it couldn't climb walls and it weighed a ton, but at least it kept on running.